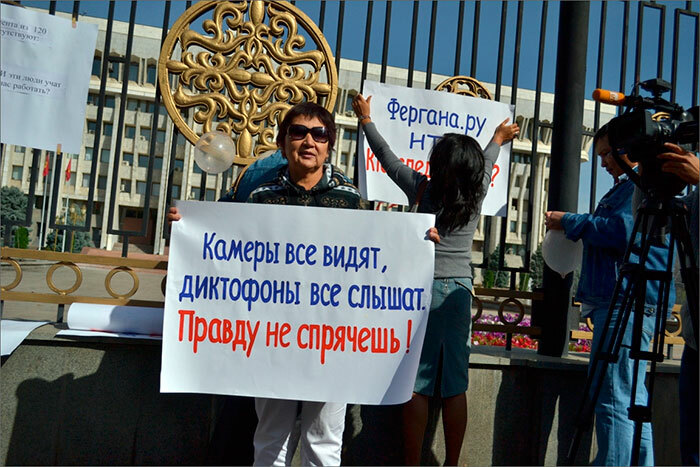 A picket called “Let’s show parliament our teeth” to defend free speech and access to information took place on 1 October 2012 outside the Kyrgyzstan Parliament building. 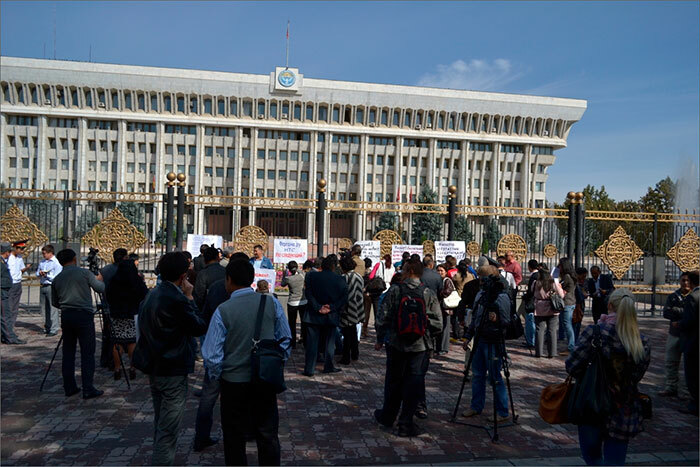 The reason for the action was that Kyrgyzstan’s MPs have attempted to sabotage journalists’ work more than once. Around 70 people gathered by the Jogorku Kenesh (parliament), around 50 of those were journalists from various national and international press outlets. Some even came with small children, whom they could not leave at home. However, not all the media participated and only some covered the event. 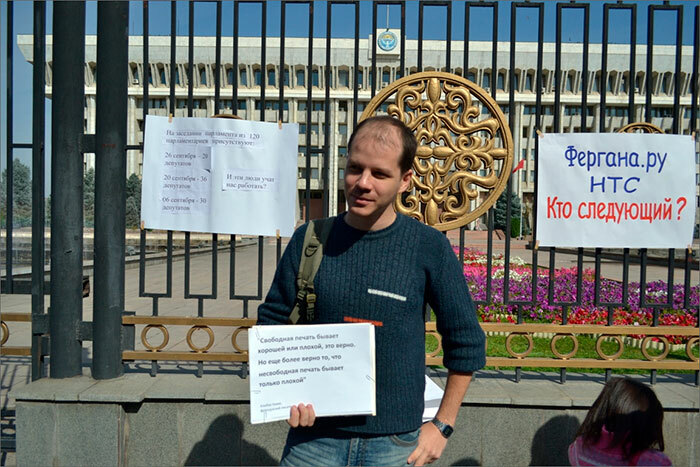 The initiator of the picket, chief editor of the “MK-Asia” newspaper Ulugbek Babakulov explained the action to Fergana as follows: “Now we need to make the first steps to unite journalists in defending themselves and their rights from the MPs. 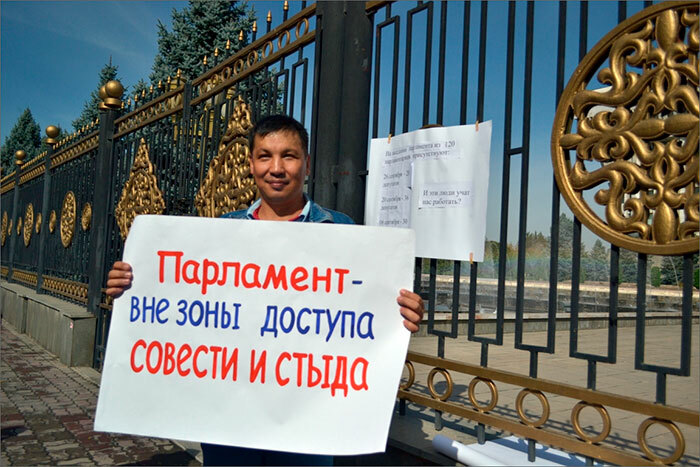 Look at how much precedent in curbing free speech there is already: Channel 5 lost its accreditation, journalists from the NTS channel were not allowed to go to a parliament meeting, Fergana.ru was blocked. An MP pursued litigation against 24.kg for 5 million soms, a dress code for journalists was introduced in parliament. We are standing against these actions by the people’s representatives and will not be silent!” Babakulov also inflated condoms and hung them on the fence, saying they symbolised “our MPs”. Begaim Usenova, Director of the Media Policy Institute, and Marat Tokoyev, Chairman of “Journalists” also came to support the journalists. The picket was peaceful and had a positive feel – the journalists stood with the posters, discussed problems of free speech, shouted “we stand for freedom of speech” and then departed to carry on with the rest of their day. Around 15 policemen kept watch and one of them filmed the proceedings. “Most importantly we showed that we weren’t born yesterday and we can show our teeth. And what now? We are sending a petition to the MPs”, said Babaulov. “There must be no banned topics for the press in Kyrgyzstan. It is the media that reports about corruption, human rights violations and raises other questions important to society. Despite the political and economic crises, Kyrgyzstan’s media has managed to make significant progress in developing free speech. Nevertheless, the main problems of free speech in the country are linked to the authoritarian thinking of some government employees. Law enforcement agencies do not always react to the violations faced by the members of the press. Moreover, the police, prosecutors and the State Committee for National Security prefer not to react to open pressure on and threats of journalists or to efforts to obstruct their work. Recently, journalists’ professional activities have been blocked more often and more blatantly by parliamentarians, who have taken the role of censors, rather than law makers. The MPs violate the constitutional right of the citizens to have access to information. Only in the last year, the people’s representatives have taken measures against media workers. In particular, during the meeting of the parliamentary commission into the looting voiced by the jailed Yusupov, MPs from the Ata-Meken fraction Natalia Nikitenko and Baktybek Kalmamatov hindered the work of NTS journalists in every possible way. Under pressure from these parliamentarians, members of the commission decided to remove the journalists from the meeting room. SDPK MP Irina Karamushkina sued information agency 24.kg and journalist Mahinur Niyazov in connection with an article regarding her announcements, having demanded five million soms through the courts for herself. In June, lawmakers took the decision to introduce a dress code for the press, which bans journalists from entering the parliament building in jeans and light clothing. Access to international information agency Fergana was blocked on the initiative of the MPs, and journalists from Channel 5, one of the leading TV companies, were refused accreditation. The MPs passed a law on transforming the channel into a parliament channel. They needed almost a year to work out that the law they had passed is impossible to implement. Мы, журналисты Кыргызстана, считаем недопустимыми цензуру в средствах массовой информации и попытки депутатов ограничить деятельность журналистов. Мы требуем принять меры по недопущению давления на прессу со стороны парламентариев. Действия депутатов можно квалифицировать ст.151 УК КР («Воспрепятствование законной профессиональной деятельности журналистов […], совершенное лицом с использованием своего служебного положения»), на что должна обратить внимание Генеральная прокуратура, осуществляющая надзор за соблюдением законности».